Pork n' beans cooked with ground beef, brown sugar and barbeque sauce. I love, love, LOVE this recipe! I usually make it for a big weekend meal like a cookout or Sunday dinner and then have enough leftovers to serve again during the week as a side dish. And the best part? The onions LOVE it! This is great to bring as a covered dish too because you can cook it in a crock pot and take it with you! Angel Baby actually made them this time. She’s 8 and is becoming quite the cook. The only thing I did to help with these was to open the cans and cut the onion. She did everything else! Brown ground beef and onions with salt and pepper to taste until meat is cooked through. Drain fat then add meat mixture to a crock pot or large saucepan. Open cans of beans and pour off any liquid that’s settled at the top. Add beans and remaining ingredients to the meat mixture and stir to incorporate. For crock pot cooking, cook on low for 4-6 hours. For stove-top cooking, heat over medium-high heat until simmering then reduce heat to low and cook, covered, for 1 hour. I have been making something very close to this for years! I only use the BBQ sauce - no ketchup or brown sugar, and add chopped bell pepper also. Everyone always loves them and they are very filling. It's so nice to be able to just carry them somewhere in the crockpot and plug them in. Next time you make them substitute one pound of sausage for the beef....layer the top wth pre-cooked bacon and HOLD ON! Looking forward to trying this recipe on the crew tonight. 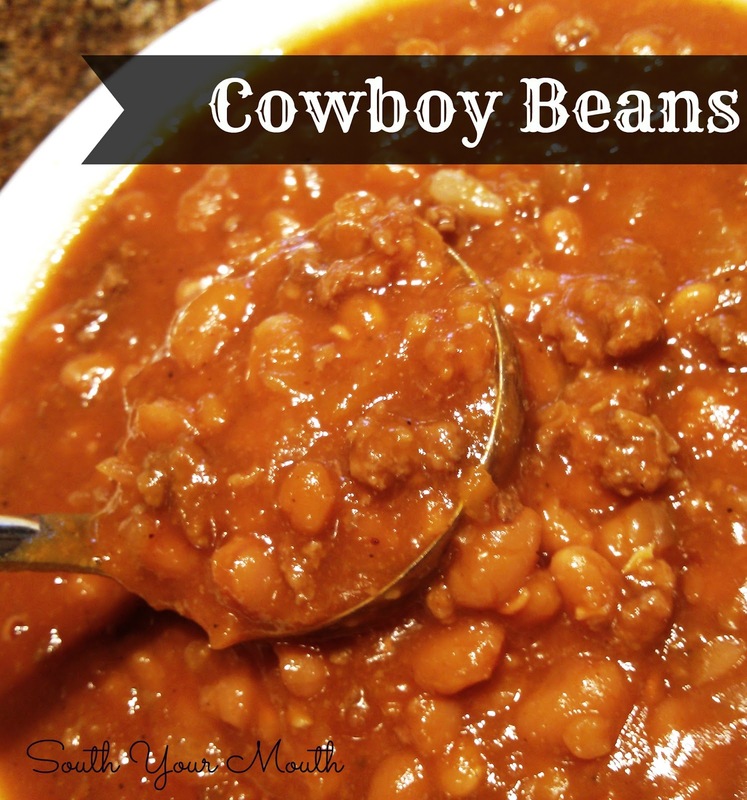 With our busy days, Cowboy Beans sounds like something we will add to the rotation. 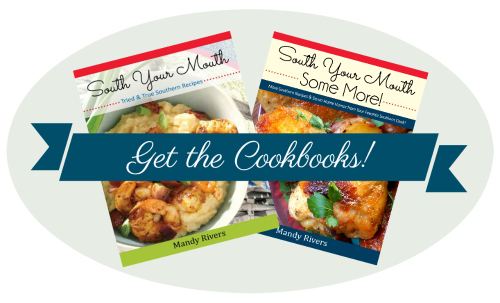 Thanks again Mandy, we love your recipes at our house. I love recipes like that, too! I've made similar ones with vegetarian ingredients and they are always a big hit! What an awesome recipe. I serve beans to over 200 folks on the street for a local Bean Days festival. This is the kind of dish folks gobble up (or down?=) Thanks so much for sharing at Weekend Potluck. My mom made a casserole like this when I was growing up and I loved it. I made these for supper tonight along with cheesy biscuits and french fries. It was like going back in time :) Thanks for sharing! I do a version of Cowboy Beans that calls for Red Kidney Beans, Butter Beans & Northern White Beans. Also add in some cooked bacon pieces. Followed word for word and served over rice, mmmmMMM !my dadsaid it is in his top 5. My family makes this all the time. It was something hubby and I grew up on and we love making it for our daughter, who also loves it. We follow the recipe step by step and it turns out great every time! I have what may be a stupid question. . Do you brown the hamburger first? Can you freeze this? I'm gonna make this soon. Thanks for the recipe! You could serve these beans over a buttered baked sweet potato for a "Hot Mess" like I do. I have saved so many of your recipes that I finally decided to sign up for your emails. I found you through "The Slow Cooker Chronicle". I have been doctoring pork n' beans for years and make a similar recipe to this called "Calico Beans." They are made like another commenter above mentioned. Keep the delish and easy recipes coming! All the gloom as well as misfortune concerning cowboy a terrific way to earlier this holiday season will need to have experienced many providers thinking whenever they had been planning to take in their whole stock involving wholesale cowboy a terrific way to. Very first, quite a few manner reports explained cowboy a terrific way to had been complete. Future Equipment Journal happened to run their 2007 retail sales report that will mentioned the most severe performer throughout headwear pertaining to malls throughout 2007 seemed to be cowboy a terrific way to crosswrods solutions. My son calls these "Woody" beans ( toy story) and eats it in bulk served over rice . Awesome. I'm going to made this as written and add 1 lb Little Smokies to the pot. Any sort of ketchup based sauce... I am a fan of Kansas City BBQ sauces. I don't have a favorite brand.